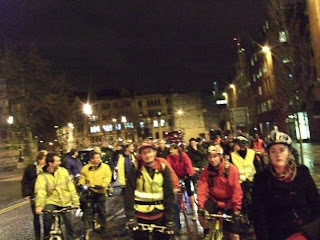 Green in Manchester - Vanessa Hall: Critical Mass was awesome! Critical Mass on Friday was great! Considering the weather was really windy and wet at times the turnout was amazing. After a varied route around the city centre we cycled through Hulme and then came back into town down the Princess Parkway, with a lap of honour round the roundabout at the end. Lots of friendly pedestrians and even some friendly motorists. Only one or two idiot drivers but overall a good, safe and quite fast ride around the city ending at Cafe Saki in Rusholme for a brilliant Benefit night. It makes me proud to be a cyclist!